The 12th of October to the 19th of October 2019. This event is an exciting new project will be run by volunteers and self-funded by Tavistock Library, the Friends of Tavistock Library and other community groups. Why Tavistock in Devon as a venue? Mrs Anna Eliza Bray was a best-selling Victorian novelist and writer who lived in the vicarage in Tavistock. She was inspired by the area’s heritage to write a series of novels including Fitz of Fitz Ford: A Tale of Destiny (1830). Her novels contain elements of Gothic-style writing. 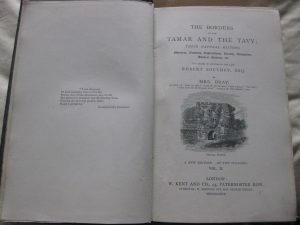 Mrs Bray’s A Peep at the Pixies, or Legends of the West(1854) was used by Christina Rossetti as source material for her most famous poem, Goblin Market. Mrs Bray moved to Tavistock when she married her second husband Edward Atkyns Bray, the vicar of Tavistock. She then began writing historical novels and when her husband died in 1857 she moved to London. Mrs Bray was a good friend of Robert Southey https://en.wikipedia.org/wiki/Robert_Southey and he spent one Christmas in Tavistock as a guest of the Brays. Mrs Bray also has a link with Tavistock’s role as part of the World Heritage mining site, because her husband was one members of the Tavistock Subscription Library (founded in 1799) http://tavistocksubscriptionlibrary.co.uk/ as was John Taylor https://en.wikipedia.org/wiki/John_Taylor_(civil_engineer). Taylor was a young mining engineer, who played a key role in the development of mining in the area and in the building of the Tavistock canal. Mrs Bray was also a member of this library, but unable to vote. Alongside authors like Sir Arthur Conan Doyle, whose ‘Hound of the Baskervilles’ was set a few miles away from Tavistock on Dartmoor. Tavistock has also been associated with women writers of repute and it is just possible that Mary Shelly may have visited Tavistock during her stay in Torquay in 1815 one year before she started to work on her novel ‘Frankenstein’. The hauntingly Gothic-style legends that make up the folklore of the area from Lady Howard’s Ghost, the Gubbinesses, the Blessed Grimbald’s (Betsy Grimbald’s) tower to the tale of the ghosts of miners. 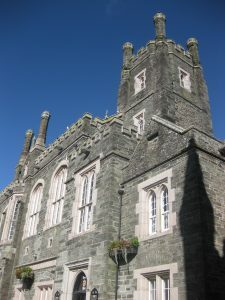 Tavistock’s mid-19th century Neo -Gothic style Town Hall. 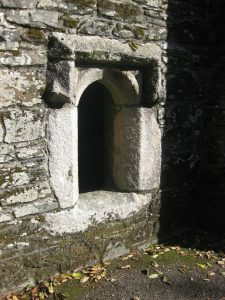 A gatehouse window. Part of the remains of Tavistock’s Benedictine Abbey.